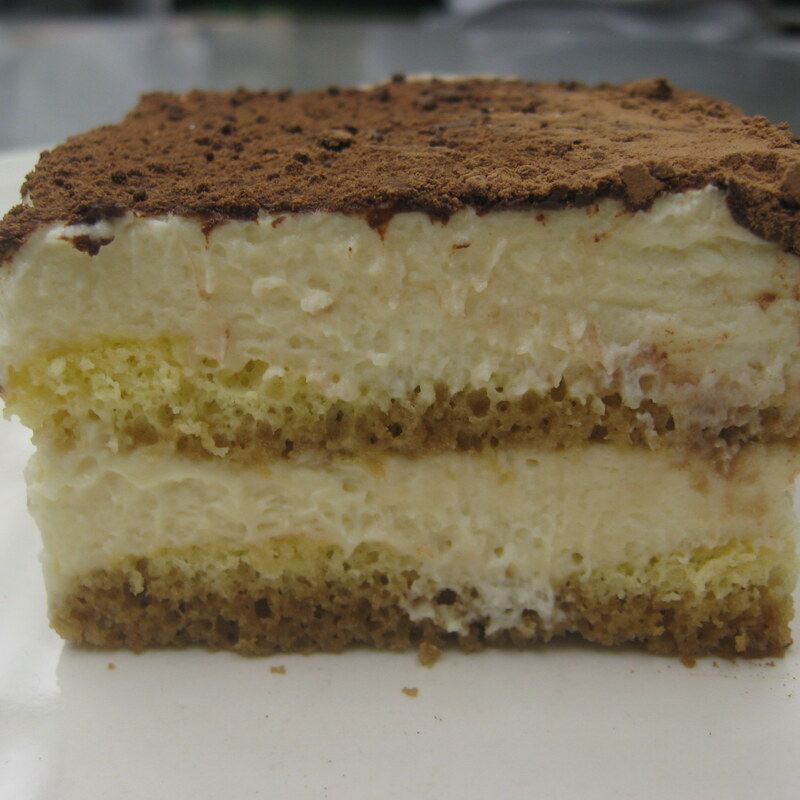 I worked at an Italian restaurant in Nashville, TN that served Tiramisu with two sauces, one hot and one cold. I fell in love. This recipe is close, very, very close to my first love. For a truly luscious experience, serve it with vanilla crème anglaise and warm espresso fudge sauce. Olivia makes this dessert in LUSCIOUS! Make one day ahead in a 13X9 pan. 2 Cups Heavy Cream WHIPPED TO SOFT PEAKS ahead of time and sweetened with ¼ cup Powdered Sugar. Keep in fridge until needed. Make a double boiler: Fill a medium saucepan with a few inches of hot water, and bring the water to a simmer. Fold the vanilla into the mascarpone cheese and vanilla until no chunks remain. Combine cooled egg yolk mixture with the cheeses. Do this slowly, a little liquid at a time to prevent lumping. Pour espresso mixture onto a dinner plate. One by one, dip the bottom of each ladyfinger in the espresso mixture. The top half should remain dry. Arrange the soaked ladyfingers side by side in a 13 X 9 pan. Spoon a third of the cheese mixture over the ladyfingers and spread it evenly. Make another layer of espresso-soaked ladyfingers, and cover them with the remaining cheese mixture. Smooth the top. Dust with a generous layer of cocoa powder. *Yes, mascarpone cheese is expensive. I have made this dish with cream cheese only and with a combo of cream cheese and mascarpone. However, cream cheese is firmer and saltier. Use more whipped cream at the end if you use cream cheese only. If you use a combo, use room temperature cream cheese, cream it until it is lump-free, and fold in the mascarpone by hand. Then proceed with the recipe.